In certain instances, you may be asked to provide personal information on our site. This information is for administrative or transaction use only. We use it to fulfill orders you have placed, better understand and serve your needs, and provide services tailored to you. We may also send you email on behalf of carefully screened third parties, but we will not share your name, email, and zip code with those partners. We do not use your information for any purpose without your consent. Your information will not be accessible to anyone other than our staff or business affiliates whose services you have requested. This information is specifically used by our affiliates to provide you with services you have requested and is not redistributed in any way. We will not sell your information to third parties unless you have authorized us to. We may, however, send you emails on behalf of third parties, and you can unsubscribe from those emails at any time. We make every effort to keep you informed of our own special events, news and offers. Periodically, we send announcements via email. If you do not wish to be contacted by our office, simply click on the unsubscribe link found at the bottom of the email newsletter. We are determined to keep your information private. All of the customer data we collect is protected against unauthorized access. We use vendors that specialize in keeping your contact information and activity on this site private and secure, and only release what you authorize us to. No warranty is made by OverDivorce.com regarding any information, services or products provided through or in connection with the service. OverDivorce.com hereby expressly disclaims any and all warranties, including without limitation: any warranties as to the availability, accuracy or content of information, products or services; any warranties of merchantability or fitness for a particular purpose. Some states/provinces do not allow the exclusion of implied warranties, so the above exclusion may not apply to you. 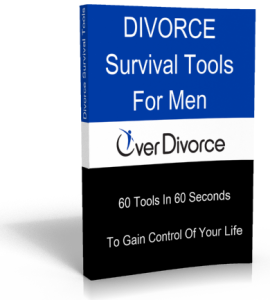 The material on OverDivorce.com is meant to be shared for informational, non-commercial use only. Site visitors are allowed to download and distribute banner graphics and promotional materials for the express purpose of promoting OverDivorce.com. Podcasts posted on OverDivorce.com can be shared, but must be linked directly back to OverDivorce.com. OverDivorce.com agrees to never sell or distribute your email address to third parties. We do reserve the right to send you email on behalf of carefully pre-screened advertising partners. Those partners will not have access to your e mail address or any other personal information about you. Unsubscribing from any email list does not necessarily unsubscribe you from other email lists within OverDivorce.com Users agree to provide OverDivorce.com with an up-to-date email address. 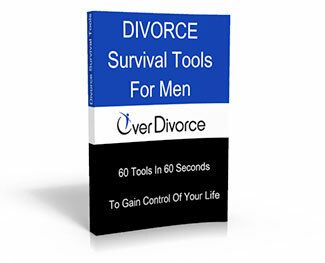 This agreement contains the entire agreement between the visitor and OverDivorce.com regarding the use of the service, and supercedes all prior written and oral understandings and writings. The agreement shall be governed pursuant to the laws of the state of ?? ?.